Dental Crowns are one of the most popular treatments in our Fethiye clinic. 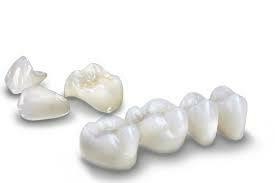 Crowns are the perfect solution for broken teeth or teeth that are weak due to a large cavity or poor enamel. They are fabricated to look like real teeth so the appearance is very natural. If you are planning a few Dental Crowns with your natural teeth in-between the dentist will choose the colour most appropriate colour to ensure a good match. 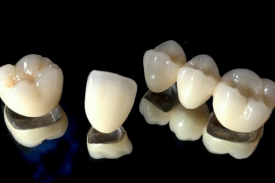 Crowns can be made from a variety of materials with the standard Crowns being Metal Porcelain (A silver metal core with porelain fused to the outside) or Zirconium Porcelain (A white metal core with porcelain fused to the outside). We also offer the very latest Pure Porcelain and E-Max Crowns created in the clinic using smile design software and Cad/ Cam technology (more information is below). The choice is yours and it will depend on the location of your Crown and of course your budget. More information about the different types of Crowns offered at our Fethiye clinic can be found below. WHAT IS THE PROCESS OF A DENTAL CROWN? How Are Crowns Created? 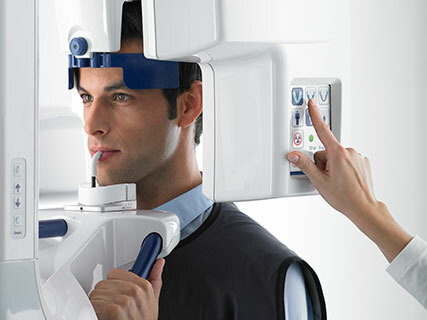 In the first stage the dentist will take a panoramic x-ray of your teeth (a panoramic x-ray provides a 2D view). The dentist will check that the roots of your teeth are healthy and you are not in need of any root canal treatment before your treatment commences. The dentist will then take an impression of your natural teeth and gums with a dental tray. 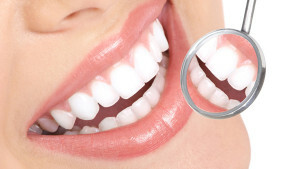 On the same day, the dentist will then prepare your natural teeth by filing the outer surface. This usually takes approximately 15 minutes per tooth. The Dentist will numb the area so you will not feel anything during the procedure. A second dental impression is then taken and sent to the local Fethiye laboratory. Within a short space of time (a few hours) we will provide temporary teeth so you can continue your holiday as normal until your new Crowns are back from the laboratory which usually takes a few days. If you have chosen Crowns as you are planning a smile makeover, the dentist will discuss your colour options. You can choose Hollywood white or a more natural white a few shades darker. The choice is your depending on your colour preference. The laboratory technicians are highly skilled and will start to create your new Crowns using the latest technology. Your Crowns are custom made based on your dental impressions and the information given by the Dentist. In some cases patients ask for larger or smaller teeth than they had previously (which is of course possible). It usually takes a few days and before the Crowns are polished they are sent back to the Fethiye dental clinic. On your second visit the Dentist will fit your new Crowns on a temporary basis to check the fitting against your natural teeth and you will have an opportunity to check the appearance. We can make any adjustments needed. The Crowns are then returned to the laboratory for their final polishing. On your third and final visit, the dentist will remove your temporary teeth and your new Crowns will be permanently cemented in place. Dental Crowns are a long term solution and many patients have the same Dental Crowns for 10-15 years before they consider replacing them. Like natural teeth and all types of Cosmetic Dentistry Crowns will discolour over time and the length of time will depend on the amount of tea and coffee you drink along with other foods that stain and of course cigarettes.